Recent release “Mama Bear” from Page Publishing author Carla Atkinson is a wise, charming picture book, lovingly illustrated by Sue Copple, that tells the story of Aldene, a young orphan bear cub who is determined to become a good mother bear when she grows up, and so prepares herself for this monumental task by observing the other forest animal mothers for best practices to adopt—such as foresight, protection, playful engagement, and encouragement—as well as bad ones (violence, neglect, etc.) to avoid. 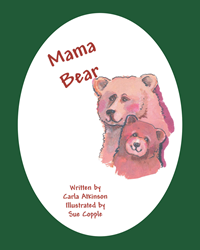 Carla Atkinson, who with her husband, Jim, runs Atkinson Family Services, a nonprofit organization providing home care through group homes and foster families as well as parent education, has completed her new book “Mama Bear”: a sage and compassionate picture-book manual emphasizing Choice Theory for good parenthood. “Aldene was a little bear who wanted to be a Mama bear. She lost her Mama in a forest fire when she was three years old. Friends in the forest were very good to her and everyone took care of her. Still, she missed having her own mother. She watched the other mothers to see what behaviors they chose. She saw the Mama Squirrel gather food and hide it for the winter. ‘I’ll be sure to save food for the winter,’ she said. She saw the wise Mama owl give her children advice. ‘I’ll be sure to give my children good advice,’ she said. Published by New York City-based Page Publishing, Carla Atkinson’s new book is a simple story that carries profound implications for parents—especially natural parents learning to make responsible, conscious choices when it comes to their children. Through an accessible children’s book format, Atkinson speaks to the whole family, both parents and would-be parents their children may grow up to be. Readers who wish to experience this transformative work can purchase “Mama Bear” at bookstores everywhere, or online at the Apple iTunes store, Amazon, Google Play, or Barnes and Noble.